When I published Finding Peace, the first book in my Love’s Compass series, in January of 2015, I had no idea where this series would take me. Over the following three years, I would write a total of six books that had my readers laughing, crying, and falling in love with these amazing families. As the one-year anniversary of the completion of this series came and went, I started thinking about having new covers created to give the series a fresh look. I also spruced up their blurbs a little so readers could quickly get a sense of what each book was about. 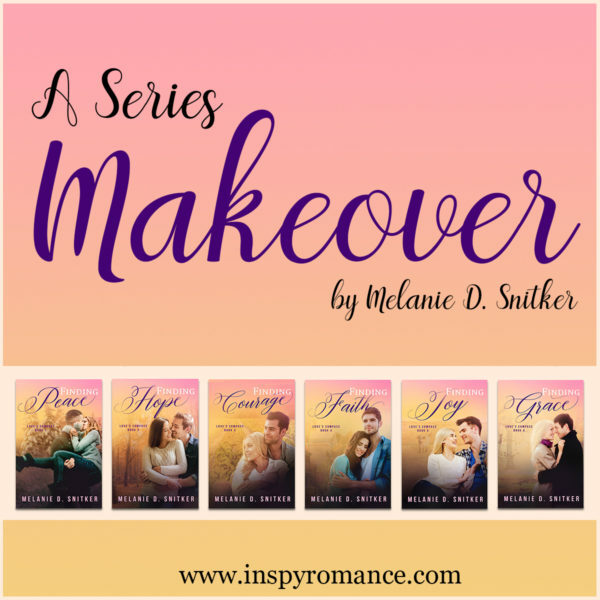 Over the last month and a half, I’ve been working with Josephine at Covers and Cupcakes to give this series a makeover. Can I just say how much I LOVE these new covers? I will always like the originals, because I feel each one represented the individual book well, but these new covers give the whole series a wonderful, cohesive look. Love’s Compass: Six books, two families, one unforgettable series. even if it means risking his own heart in the process. For years, Lance avoided telling Lexi how he felt. for a second chance…and even more to extend one. the harder it is to imagine a future apart. what seems like a dead end might really be a new beginning. remind her of the family she used to dream of. GIVEAWAY: Which of the new covers is your favorite? Comment, and you’ll be entered for your chance to win a digital copy of any one of my books. I’ll leave the giveaway open through Friday, April 5th, and then a winner will be chosen randomly and contacted through e-mail. Hi Melanie, oooh, hard question. I like the continuity of the new covers- each book is clearly part of a series that is tied together. The covers also invite a closer look to see the detail in the background. I do like the old covers though they are busier than the new ones. Thanks, Wemble! Yeah, both sets of covers worked well for the series! I hope you’re having a great day! I love the new covers! My favorite is Finding Courage. Thanks for your response, Lori! Thanks, Toni! It was so much fun working with the cover artist on these! Hi Melanie! The new covers have a cohesive look with a hint of mystery in the shadows. My favorite is Finding Hope. Congrats and best wishes. I love the way the new covers all.go together, definitely says a series is here, lol! Thanks, Paula Marie! Yes, I wanted no doubt they were all one series! I love the original covers but the new covers really makes a difference. Love all the covers. The color scheme is amazing. I love the new Cover Finding Grace. Hi Danie! Thanks so much for commenting. Finding new authors is always a good thing! I hope you have a fabulous day. I like the new coves they make me want to take a closer look. Sorry if that’s a disappointment. I like all of the old covers and couldn’t pick a favorite. I probably like books 1 and 2 of the new ones… As for the books, I like all of the ones I’ve read which is probably all but one. I like the Finding Courage cover the most. Hi, Susan! Thanks for your comment! I love the new covers for books 3 and 4. Maybe it’s the couples, but definitely appealing. My favorite cover is Finding Faith. I have to agree with Priscila. When a new book comes out, you see its cover and know what you are looking for – whether watching for that book to go on sale or seeing what you already have in a series. Also, if you have discovered a new author and you’re trying to find their old books and the covers get changed, you don’t want an unmatched set. That being said, in your case, I love the colors on the new covers and they definitely look better together as a series. I think I like the cover of Finding Courage the best. Beautiful covers! I think I like Finding Courage best! Hi, Regina. Thanks for taking time to comment! I like the book cover for Finding Peace the best…I have to admit, I like the old covers better. I like the color, nature vibe and romance of those. Sorry. But I’m happy that you like the new ones and they meet all your expectations. Thanks for taking the time to comment, Chanel! I appreciate it! There are definitely aspects of the old covers I’m going to miss – specifically the covers for Finding Joy and Grace. But I do feel like some of the newer covers do a better job of expressing the story – especially Finding Hope! Pretty new covers. My favorite is Hope. It is cozy looking. Love her sweater. Welcome Melanie. This is a tough question. I like how the old covers depict the title. But as a series, I like how the new covers have conformity. I love the cohesiveness of the series with the new covers!! I think Hope is my favorite. Hi, Lila! Thank you – Hope is my favorite as well! Tough question! I think Finding Hope and Finding Peace are my two favorites. I love the old covers but the new ones are beautiful too and more uniform. I really love all the beautiful new covers! Maybe Finding Grace or Finding Hope- difficult to decide. Love the new covers. My favorite is Finding Courage. Thanks for the reply, Joyce! Congrats on the new covers and anniversary. My favorite is Finding Hope.